As you can see, the unexpected drama with Amazon did not even cause us to break our stride. Chuck Dixon’s Avalon #3 is now available in high-resolution digital format from Arkhaven. Chuck Dixon is the most prolific comic book writer in history. 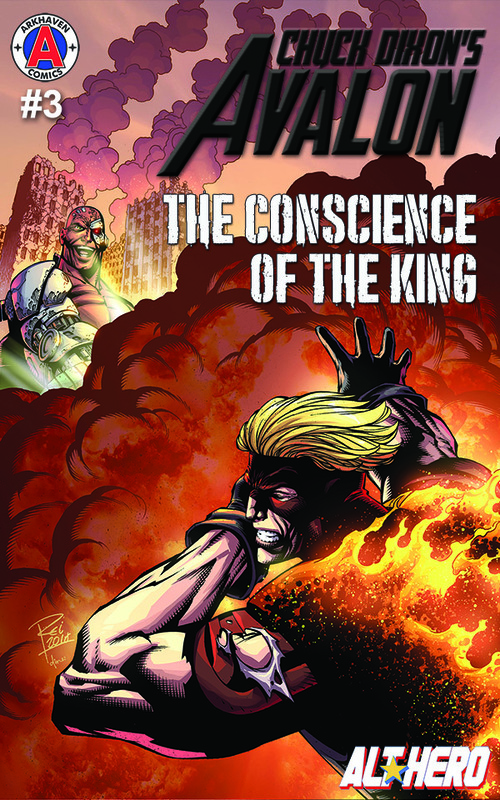 Set in the world of Alt★Hero, CHUCK DIXON’S AVALON is the legend’s newest creation. The CBZ file contains high-quality 2048 x 1316 images. 24 pages. DRM-free. $2.99. The print and Kindle editions will be available soon. We are still working with Ingram on sending out the replacement Issue #2 to those who received the silent editions. As the first two issues of CHUCK DIXON’S AVALON are no longer exclusive to Kindle Select, we will make high-resolution CBZ-format editions available on the Arkhaven store this weekend. Please note that as of issue #3, we have changed over to standard comics format for the single issues. The omnibus editions will still be 10×7. Are any of these comics appropriate for kids 7-10?